Disillusioned by the behaviour of her fellow humans, Ruth (Melanie Lynskey) decides to take matters into her own hands after her home is burgled, enlisting the help of neighbour, Tony (Elijah Wood). Macon Blair’s directorial debut, I Don’t Feel At Home In This World Anymore, starts with a familiar sense that today’s world is full of ignorant, selfish people. People who pollute, people who walk away from their messes, people who spoil the enjoyment of (and could not care less about) others. It is, therefore, easy to feel sympathy for Ruth. Who could blame her for wanting some element of justice? However, as understandable as the ensuing vigilante actions are, they threaten to land Ruth and her side-kick Tony (Elijah Wood) in real danger. In telling Ruth’s story, Blair creates unsettling tension and brutal violence and mixes it with some wonderful dark and twisty comedy. At times the film feels almost Tarantino-esque in its tone - although it is, admittedly, smaller in scale. I Don’t Feel At Home In This World Anymore also brings Jeremy Saulnier’s Blue Ruin to mind. Unsurprising, perhaps, as this film starred Macon Blair in the central role and the two filmmakers are longtime friends. 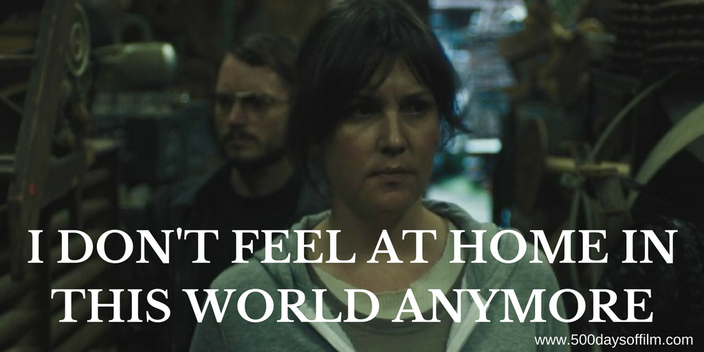 The balance between tension and comedy work thanks in large part to Melanie Lynskey’s superb and engaging performance. Meanwhile, Elijah Wood is brilliantly, endearingly eccentric (and almost unrecognisable) in his role. If you are after 1 hour and 33 minutes of enjoyable tension and fun, I would recommend I Don’t Feel At Home In This World Anymore. If this debut is anything to go by, Macon Blair is a director to look out for in the future. You can watch Macon Blair’s film on Netflix. Have you seen I Don’t Feel At Home In This World Anymore? If so, what did you think about this movie? Let me know… leave me a comment in the section below.